If you want to keep lawns green and healthy throughout the growing season, a lawn sweeper is an essential piece of equipment. These tools have several lawn care benefits, making them useful for homeowners and professional landscapers. Let’s take a look at how a Sweep-All lawn sweeper can help you with lawn care maintenance. How Do Lawn Sweepers Benefit Turf? There are many reasons to use a lawn sweeper. First and foremost, sweeping makes the lawn look tidy once mowing and other lawn care tasks are done, which is something that landscaping clients will enjoy. This is a particularly important task during certain seasons. For instance, if grass has grown a bit too high in spring, then excess grass clippings can cause brown patches throughout the yard. Sweeping the clippings is a great way to eliminate this issue. Similarly, in fall, you’ll need to remove leaves, acorns, fallen fruit and other debris as part of a good grass lawn care routine that keeps the turf healthy throughout winter and gets it off to a good start in spring. A lawn sweeper is the easiest and most efficient way to accomplish this task. This tool also prevents wear and tear on mowers. With a sweeper, you can get rid of nuts, twigs, gravel, etc. that would damage mower blades. Because dethatching removes a layer of dead grass, this process allows more air and water to get to the soil, which aids in healthy turf growth. Removing a layer of thatch also enables more nutrients to seep into the soil. This is especially important if you use fertilizers or compost on the lawn. If you need to reseed a lawn, then removing the thatch beforehand will help ensure the seeds have the essential seed-to-soil contact needed to sprout. Removing thatch beautifies the lawn because it eliminates old, brown growth that dulls the effect of fresh, green growth. Why Choose a Sweep-All Series Sweeper for Lawn Care? Now that you know the benefits of lawn care with a lawn sweeper, you’re probably wondering what makes our series of sweepers ideal for these jobs. For one thing, Sweep-All’s models are all power-driven — either by a Honda engine or by a tractor’s powered takeoff. These machines are more powerful — and more capable — than the average ground-driven sweeper. Additionally, these sweepers are made with heavier-grade steel parts, which makes for a much more durable and long-lasting piece of equipment as compared to sweepers that may feature thinner steel and plastic parts. There are some other features that make Sweep-All sweepers the best on the market. Both the HMW and TPW models have large hoppers, which make unloading clippings and debris easy. For large lawns, or for landscapers with many lawns to sweep, the HMW model offers a scissor-lift hopper for debris that needs to be unloaded into a dumpster or hauled away. Sweep-All sweepers also have adjustable broom speeds and heights, so these sweepers are more versatile than other brands. You can easily switch between settings appropriate for debris cleanup to speeds and heights necessary for dethatching. 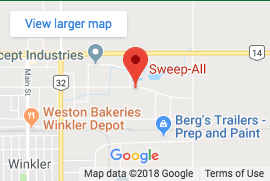 If you’d like to learn more about how Sweep-All’s line of sweepers can benefit your lawn or landscaping business, don’t hesitate to contact us. Take a look at our website today to find the sweeper that fits your needs!